Universal Century Gundam Online is a MMO based on the long-running anime series. 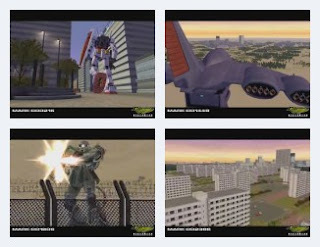 The benchmark shows a battle between Earth Federation and Zeon mobile units in amongst a city. Big robot action, but of the stand-and-fire variety. Good music and sound effects. Not many graphic effects, considering the subject matter. Framerate drops a little during wide landscape shots. Short running time. Recommended. i cant go to the website of the game. Is it still there? Is there an english version of this game and does it still exist?